Wisconsin is home to key ingredients for a proper National Pancake Day breakfast- Smoky Bacon, Lean Canadian Bacon, and sweet Maple Syrup. No need for an alarm; use the sizzle and aroma of our award-winning Bacon to wake up your household. Nueske’s Applewood Smoked Bacon comes in many varieties – Applewood Smoked, all natural and uncured Wild Cherrywood, and Pepper Coated. We also have them in different thicknesses, for those of you that like a bacon “steak” or for the lovers of thin bacon. There is something that will suit any bacon enthusiast. Try our Super Sampler, so you don’t have to pick just one! Not only does Nueske’s Applewood Smoked Meats offer the main dish, but some other- just as delectable- breakfast necessities. Our perfectly portioned, 1 lb. sweet and Smoky Boneless Ham Steak and Corned Beef Hash can also steal the show at your National Pancake Day celebration. Try any of our wonderful Breakfast Baskets to create your favorite morning meal- Pancake mix included! Comfort food, coming right up. This cheesy, melty sandwich is the stuff of chilly-day dreams; a sandwich to be eaten during time spent with a cozy gathering of friends or while curled up with a book… food made for winter holidays. Big, thick sourdough bread is toasted to a golden crunch and topped with rich, nutty Gruyere cheese. The Gruyere is beautifully melted, then layered with hearty slices of robust, smoky Nueske’s Applewood Smoked Bacon and sweet, earthy California Mission Figs. One final warming under the broiler, and these memorable open-faced sandwiches are ready to serve. This is a sandwich you can serve as an entrée – with a knife and fork – or cut in halves or quarters and served as the perfect winter holiday appetizer. This warm, toasty dish pairs well with hot cider or with a variety of “holiday cheer”… Happy New Year’s! Heat oven to 375°F and brush melted butter on bread slices. Place bread slices on baking sheet and toast until lightly golden-brown, then remove from oven. 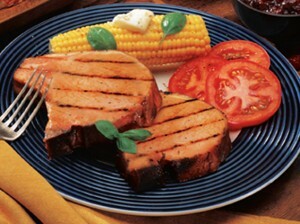 Place the bacon slices in a cold frying pan on the stovetop, and bring bacon to medium heat, turning as needed. Once bacon is just beginning to brown – about one step before it’s at your desired level of doneness, as there will be a bit of further cooking – remove it from the pan and place on paper towel, to drain. Place half the cheese on each slice of toasted bread and top each open-faced sandwich with 3 slices of bacon and half of the figs. Return to the oven, at 375°F, until cheese begins to melt, then broil for the final minute. Serve immediately. 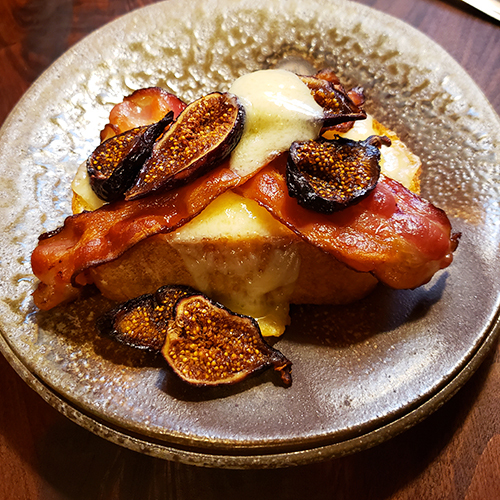 Open-faced grilled cheese sandwich made with Nueske’s Applewood Smoked Bacon, California Mission Figs, and Gruyere. This is the ideal New Year’s party appetizer: spicy, sweet, and smoky bites with big flavor, served on crispy-crunchy toasts. Each bite-sized app has a megaton of flavor, so a few plates of these being passed around at your next gathering go a long way towards making some terrific food memories for all. We created these zippy bites by topping slices of toasted baguette with a backbone of chevré garnished with wedges of Sun-Maid® California Calimyrna Figs and crisp pieces of Nueske’s® Pepper-Coated Bacon; a version of our classic Applewood Smoked Bacon that’s been hand-rubbed with fresh-cracked Tellicherry peppercorns. 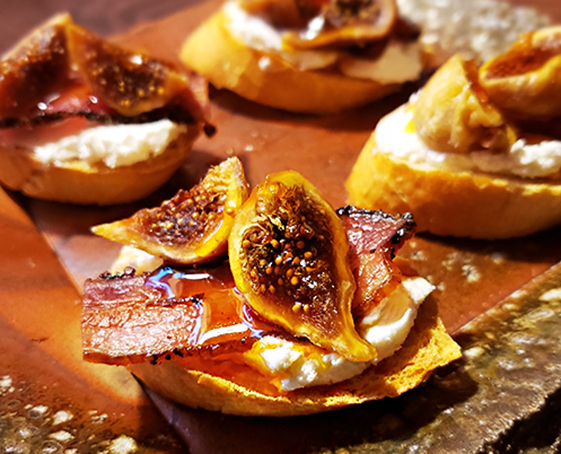 Once the chevré is spread and the figs and bacon are in place, we drizzled Mike’s Hot Honey® over each bite-sized piece, but if you’re not a fan of the heat, substituting your favorite non-spicy honey is just as tasty… or try making a batch of both spicy and non-spicy toasts and see which version your guests prefer! Brush the baguette slices with olive oil and place on baking sheet. Toast lightly in the oven, removing when just turning golden-brown. While bread is toasting, place halved pepper bacon slices in a cold frying pan on the stove top and bring temperature up to medium, turning bacon as needed and removing bacon slices when they are just browned. Please bacon on paper towel, to drain. Spread ½ oz. of chevré on each toast, then top with one bacon piece and two fig halves. Drizzle with spicy (or not!) honey and serve. This recipe might just be the one to pull you out of your post-holiday baking vacation. It’s likely you’ve spent some time in the kitchen over the last few weeks, but this sweet-and-savory shortbread cookie recipe is so simple to prepare that even the non-baking writer of this blog entry couldn’t deny its place in the permanent recipe files. These simple shortbread cookies are studded with crispy little bits of Nueske’s Uncured Cherrywood Smoked Bacon and tiny chunks of understated sweetness coming from Blue Ribbon Orchard Choice® Mission Figlets. 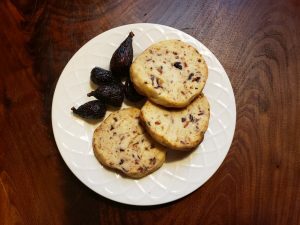 This traditional shortbread recipe not only features savory bacon and earthy fig notes, but we also added a tiny bit of potent cinnamon to add a pleasantly wintery feel to these crisp cookies. Shortbread is just right for pairing with tea, milk, and, considering the savory, smoky factor that these cookies possess, perhaps a sparkling holiday beverage pairing is in also order. Try making your own batch and let us know what your friends think! Shortbread cookies studded with Nueske’s Bacon and California Mission Figlets. Place finely diced Nueske’s bacon in a cold frying pan on the stovetop and bring up to medium heat. Stir the diced bacon frequently, as it’s frying. Remove from pan with a slotted spoon or spatula once it is crisp and nicely browned. Place bacon on paper towel, to drain. 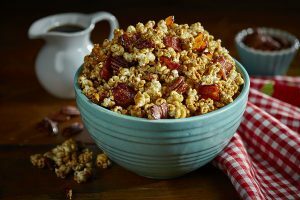 Set bacon pieces aside and pour bacon drippings into heat-safe bowl or container and place in the freezer or refrigerator to solidify the bacon drippings for use in this recipe. In a large bowl or stand mixer, place room-temperature butter, cooled bacon drippings, sugar, vanilla, salt, and cinnamon. Mix on low until the mixture is smooth, then slowly add in the flour and mix at medium speed, as the batter will become very stiff. Add the fried bacon pieces and diced figlets into the batter and mix until well-incorporated. Remove the dough from the bowl and place on floured surface, rolling into a long tube shape approximately 1 1/2” in diameter, that you will slice your cookies from. Wrap this dough column in plastic wrap and place in your refrigerator for about 1 hour, preheating your oven to 375°F before removing the dough from your refrigerator. After the dough has been allowed to chill, remove from refrigerator, unwrap, and slice the column of dough into cookies that are ¼” thick. Place cookies on ungreased baking sheet and bake for about 20 minutes, making sure the edges are only just slightly browned before removing from oven. Once the temperatures start dropping in The Northwoods, the garden tomato season comes to halt. Mornings are chilly and fall colors start appearing in the hardwoods. Summer is short lived in Wisconsin, but we do everything we can to prolong the season and to savor every last bit of summer. BLTs are especially satisfying this time of year, as fresh tomatoes will soon be spent, and we’ll be gathering pumpkins and apples instead. Whether you’re looking forward to fall or holding on to the last threads of summer, there’s no better duo than the tanginess of tomato and sweet smokiness of Nueske’s Bacon to showcase all that summer provided. 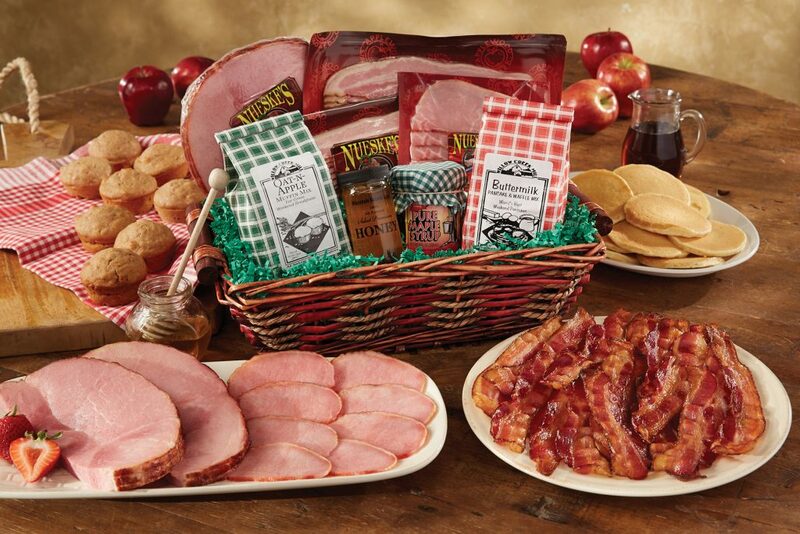 Try Nueske’s Smoked Bacon Super Sampler to pair with your remaining ripe, juicy tomatoes. The combinations are endless with this variety pack… and we recommend trying avocados on your next BLT, too – they lend a creamy layer of flavor that’s a perfect match for our bacons! 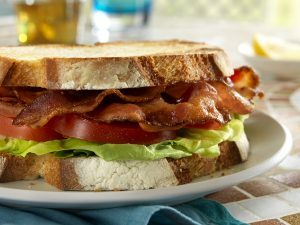 A BLT made with Nueske’s Smoked Bacon. Here are our favorite recipes, each one including Nueske’s smoky bacon and the bright tang of fresh, ripe tomato. We even have an excellent green tomato BLT recipe for you to try, in case you’ve got some garden goodness that hasn’t had time to turn red! June Dairy Month – We’ve Got Wisconsin Cheese! Over 3 billion pounds of cheese are produced each year in America’s Dairy Land. Wisconsin Cheese has earned more national and international awards for excellence than any other state or country, according to the Wisconsin Milk Marketing Board. Approximately 126 cheese makers produce hundreds of different varieties of cheese that are shipped all over the world. Wisconsinites know their cheese, and we want to share a favorite with you, Widmer’s Traditional Trio. 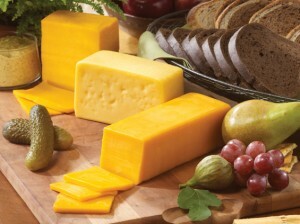 Widmer’s cheese has exceptional flavor and exhibits Old World texture and taste. Unless you reside in Wisconsin, you will not find a cheese like this at your local grocery store. Widmer’s melted Mild Cheddar in a grilled cheese sandwich paired with Nueske’s Applewood Smoked Pepper Bacon makes an indulgent lunch or simple dinner. Widmer’s Trio makes the perfect cheese plate or charcuterie side. Check out these recipes; Widmer’s cheeses will make the perfect addition. Traditional Wisconsin cheeses from Widmer’s. There are some things that Wisconsinites are particularly well-known for: amazing cheese (and sausage! ), our passion for the Green-&-Gold, and our abiding love for the great outdoors. When summer hits, everything comes alive in The Northwoods. You can feel the excitement of the locals in the air; our rush to plant the crops for our short growing season, preparations to make our summer tourists from the south feel welcome, boating-floating-waterskiing-fishing on our 15,000 lakes, hiking in endless miles of wild, unruly forest… As our Midwestern days become longer, life moves at a different pace when June begins. We try to cram every bit of outdoor activity we can into each warm day, savoring every pleasant second before the next long, frigid winter creeps in. …And we want to take advantage of being outside so much that we grill every chance we get. It’s not uncommon to see grilling occurring year-round in Wisconsin (yes, some of us can’t kick the craving of a nice grilled bratwurst even when it is -40°F out) but the prime time for grilling falls in the undeniably hot and humid summer months. Summer is Wisconsin’s sweet spot for standing outside with tongs in hand, listening to plump sausages sizzling on hot grill grates. When it comes to choosing the perfect ham for your family’s special occasion there are a few basic questions everyone asks, Bone-In or Boneless? Traditional or Spiral-Sliced & Honey-Glazed? There are no wrong answers; it depends on your personal preference. There are always a few questions surrounding the topic of preparation. How do I store it? How do I cook it? How do I serve it?